Peter Drake, McBroke, 2010, acrylic on canvas. Peter Drake is one of the artists featured in our current Families exhibition, A Family Affair, which includes an outstanding selection of contemporary works that all embrace the theme of family. Currently on view is Drake's McBroke, a work that delivers a bizarre and mixed arrangement of foreground and background imagery, creating a field of playful content between the realms. The format of this painting follows a style from a previous series where the artist used antique lead figurines as a still-life point of departure. In that series, as in McBroke, Drake is interested in shifting scales and absurd juxtapositions—even upending the relationship between the protagonists in the work and the environments in which they are situated. Doing so adds layers of contradiction and interesting possibilities for metaphor. What was once serious becomes absurd, and innocence turns eerie and morbid. McBroke presents an in-your-face triumvirate of two show horses and a clown in extreme close-up, back-dropped by a sickly idyllic landscape of opulence. 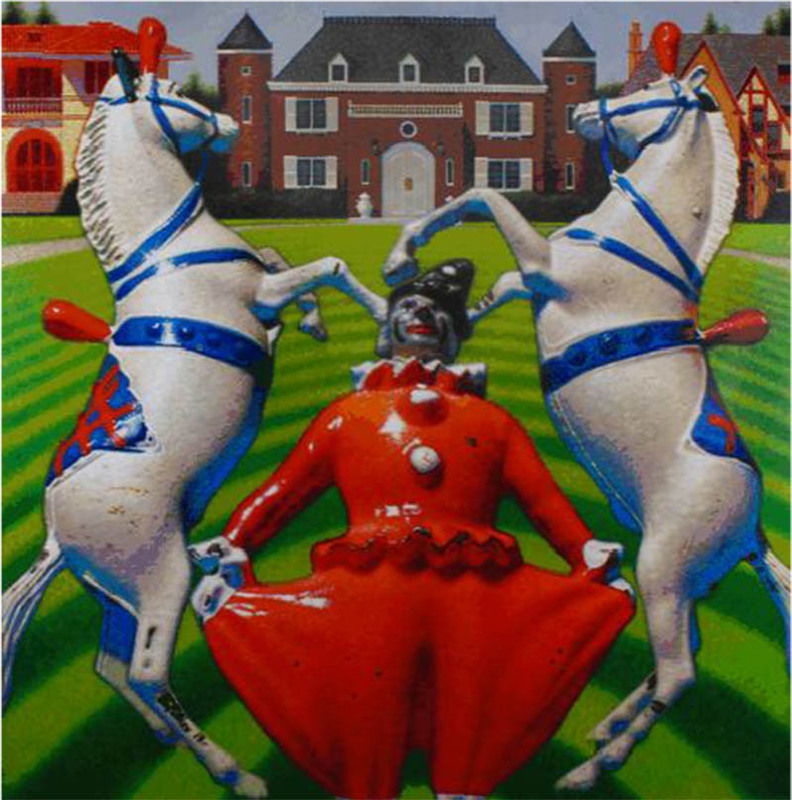 Together, the horses and the clown start to look like an iconic coat-of-arms, the very calling card for palatial living. One gets the sense even, that this exact image might exist as a relief above the doors of the mansion in the center of the background. However, far from being some serious proclamation, this arrangement is comical and unsettling. The characters conjure thoughts of fanfare and whimsy, of play and childishness, therefore undermining the stoicism present in most coat-of-arms. With all this, what might Drake be attempting to communicate? Is there a critique of wealth? Does he mock the pageantry of the rich? What might the title of the painting suggest? Does this painting make you feel “loomed-over.” Do you get the sense that you are in a circus fun-house, being taunted by jarring characters delivering humorous, yet biting commentary?